more hype followers. conversion please explain where you have seen proof that he is a fine player because i have seen plenty of proof to the contrary.also dont confuse mock draft sites and the nfl network ranking of players with how nfl warrooms rank them.smith has been ranked right with prince or even higher by most blesto scouts.and believe me he has answered the questions about his past and has come thru the process very nicely.how many of you know he became a newborn christian after his jr season and has turned his life around completely.thats a little known fact that the guys on the network are,nt talking about. Have you ever watched any games in person? I watched him very closely against Iowa State and Texas in person and the guy is a stud. He's got great acceleration, extremely fluid, good hands/body control, excellent footwork, good and physical at the line...do you want me to go on? How about good tackling in the open field? Yeah, he's got it. Sure, he didn't pick off a ton of passes, but it's hard to when the QB is throwing the opposite side of the field all game. Sorry your youtube clips don't show you the kind of player he really is. you watched closely huh.well i did to and i saw kirkendoll eat him up pretty well and had 6 catches for 87 yards against prince.and yeah he played pretty well against iowa st.who was his competion in that game?hamilton and darks please not exactly pro material.you gotta come at me with facts i do this for a living. Jimmy Smith will be great.... at safety. Do this for a living? I think Jimmy Smith has the potential to be the top CB in the draft as well. Here is the problem I see with Smith: The Lions have been burned in the past and I'm not so sure that they can afford to take a lot of risks on character? One thing I do know is that we don't know these players or get the oppotunity to talk with them, so we don't know the in's and out's of their situations. allendlions - please remember we are all fans of the sport and we see things through different eyes. We all think we are professional scouts at the end of the day, but again it's what makes us fans and it's what makes this site fun, because these guys are passionate. Now I suppose your going to wow us with your career choice, that I feel certain of. I for one hope you have some inside information to share with us, as long as it is truth to the best of your knowledge and not made up BS. So hit us with it already! Welcome to the Board, I think you'll like it here! I'll admit that I didn't watch as much college football this year as usual due to my job and my political activism, but I liked what I saw from Prince in the few times I watched him. Just as important, he stood out to me last year while I watched many more Nebraska games to take a look at Suh. Is he a Revis, Woodson, or Alphabet? Nope. But he does have the size, speed, and toughness to become a solid starting CB in the NFL IMO. As many of you know, trying to evaluate a CB from a TV screen is nearly impossible, especially those that aren't thrown at very often. So, what I like to do is look at their positioning during every wide angle shot. In most of those cases, Prince is right there with the WR he's covering. That's what impresses me the most, along with his tackling ability. Those that only look at where the ball is going, don't normally notice this. There's a reason why he wasn't thrown at very often. I can kind of agree, because from whatever I've seen of Prince, I haven't really been floored. At least not from this year. There was some Aaron Curry retrospective earlier, and I can honestly say that the drafting Prince movement smacks of the Curry or bust crowd. I remember having to scour whatever video was available to convince me that Curry was the best selection. Not sure about Jimmy Smith, but I do love what I see of Ras-I Dowling. Now there's a corner who plays with a chip on his shoulder. The only thing that I can agree with is that Peterson is the top of the class. That guy plays the position effortlessly. I think the only thing that doesn't bother me about drafting Prince, is that his stock is pretty high, and selecting him at 13 kind of fits the need/value slot. It's just that, it would honestly be based on hearsay that others believe he's a top flight corner. first off i,ll get it out of the way.i work for blesto and we will leave it at that.now i,ll say this i dont hate prince and i think from my evaluations if he is drafted by a team that plays heavy zone schemes he will have a nice career or even a move to strong safety would benefit him nicely.also there is risk with jimmy smith but not as much as alot of you think.now my favorite corner this year is ras i dowling and if it was'nt for the injury's he would be the clear number two corner.and in a perfect world detroit could trade out of 13 into the middle of round one and select someone like pouncey to fill the need at rightguard and then select dowling in round two and if they recieved another pick in round two from the move down select bruce carter to man the hole on the strongside .also dont be so fast to move ashley palmer out of your starting lineup because you have a real diamond in that young man. If the Lions draft fell that way, I for one would feel we had a very successful draft. Only thing that might bother me is spending a second on Carter. Is the prognosis positive? In regards to Palmer, saw some positive things from him last year, hope he develops into a solid starter. all the med reports we have received on carter have been positive and he should be ready to resume all football activities by late august early september.another linebacker on detroits squad to keep an eye on in training camp is caleb campbell .He should really start to make a name for himself on special teams this season and i would'nt be surprised to see him get a few reps in with the starters towards the end of the season.johnson, caleb and bobby carpenter should give the team some nice depth outside but would still like to see how dizon comes back because he was playing quite well before the knee injury. Now I have to call you out.....Dizon?! Please. Dizon is about the only player on the Lions that makes Stafford look healthy. Dizon can't stay on the field, and isn't particularly physical when he is healthy enough to play. 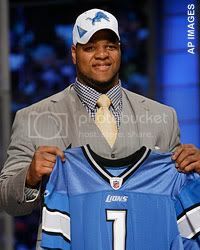 The guy was yet another of Millen's wasted picks, and I for one feel the Lions should just cut him and move on. He's a waste of a roster spot. I totally agree. I dont even wanna here the name Dizon.